Matcha is a Chrome extension made by Bonus Money that makes it much easier to find suitable bets to qualify for Horse racing promotions. Every weekend bookies fight for your betting dollars. One of the major ways they do this is in the form of promotions. The main type of promotions are cash back and bonus bets if your horse comes second or third. You could visit every bookmakers site and check what promotions they have on offer. Our offer calendar that lists all promotions with a positive expected value. You can also see which race have promotions by clicking on the Matcha and click "only events with bonuses". There are no current offers available. Once you have selected a race open it in the Matcha make sure your settings are correct. Select the bookmakers which you are looking to place bets with. You can select all the bookmakers or individually tick the ones you want to play. Ensure you have selected qualifier. As you are aiming to obtain a bonus bet as well as the correct stake. Don't stake more than the max bonus bet refund amount. Eg, if the promo you are playing is a 2nd/3rd refund up to $50 back, you shouldn't place more than $50. Reason being is that any stake above this amount eats into the value you are taking from the bookmaker. You can now select 'Open tabs'. The appropriate Betfair market, as well as the bookie pages, will open in your browser. You now wait until you see a green match, dependent on the colour bounds you have set. The default setting shows green matches when the qualifying cost is under 10% of the back stake. As you can see in the image, a match has been found. The Qualifying Stake Amount to place at the lay price of 2.26 is $48.86. This is how much your lay stake is. Then you have the Qualifying loss. Placing both the $50 back bet with Sportsbet at odds of 2.15, and the $48.86 lay stake at lay odds of 2.26, means you'll lose $4.06. The last bit of info shown under the horse is your Qualifying loss as a percentage. You can see this is -8.12%. Which as indicated, means a green bar is shown as it's under the 10% threshold. Once you are happy with your selection, place the back bet with the bookmaker. Once you've placed your back bet you then place your lay bet with Betfair. Make sure that you lay the correct amount, as shown in the Matcha. If you look at the Qualifying Stake (QSt), you'll know exactly how much to lay. We've made the process very simple. If you click on the Qualifying stake amount in the ribbon of your selected horse, the amount will be copied to your clipboard. 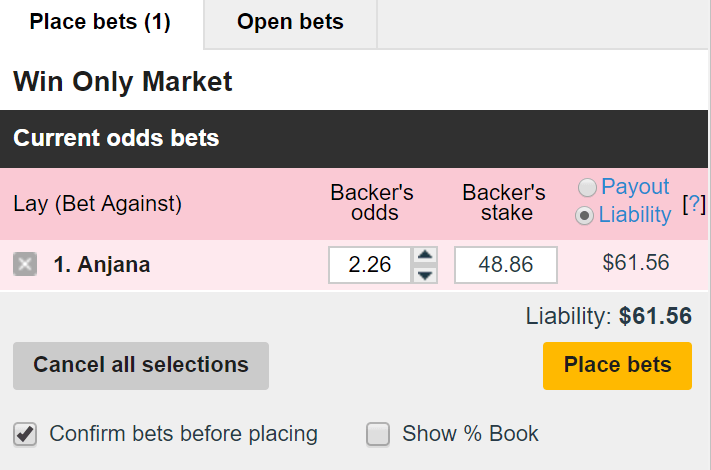 This means that you can then paste the amount into the Betfair bet slip. It's important to understand that we are staking the odds massively in our favour by using this method. Following the above example If we placed $50 with Sportsbet where the back odds are 2.15 and laying on Betfair at the price of 2.26. We would be losing $4.06 placing these two bets, in the hope that the horse runs 2nd or 3rd. Should that happen, we would obtain a bonus bet, where we would look to make at least 75% retention on the value of the bonus. So $37.50. So in effect, the bet is $4.06 and the profit would be $33.44 ($37.50 - 4.06). Why is this such a good bet? If we look at the probabilities of the outcomes of where this horse would finish. When possible always follow the Betfair prices when looking at true probability. Bookmaker odds have margins factored into them, whereas Betfair doesn’t. For ease of reference in this case, we’ll use the Sportsbet prices. You can see both prices for win and place markets. So the Horse has a 36.82% chance of running 2nd or 3rd. In terms of odds, you should be given a price of $2.72 for this. The odds's you're actually getting is much higher than $2.72. Remember, you are effectively betting $4.06 to obtain a bonus bet where you would profit $37.50 from turning it over. The odds you have created for yourself are $37.50/$4.06 = $9.23. Which is paying you 3.39 times than the true price. Over the long haul, you can expect to take between $6 and $10 from each 2nd/3rd offer. If you take a look out our Expected Value guide, this will explain to you in great detail the importance of +EV. Check out the video below to see the Matcha in action being used to gain a bonus bet.